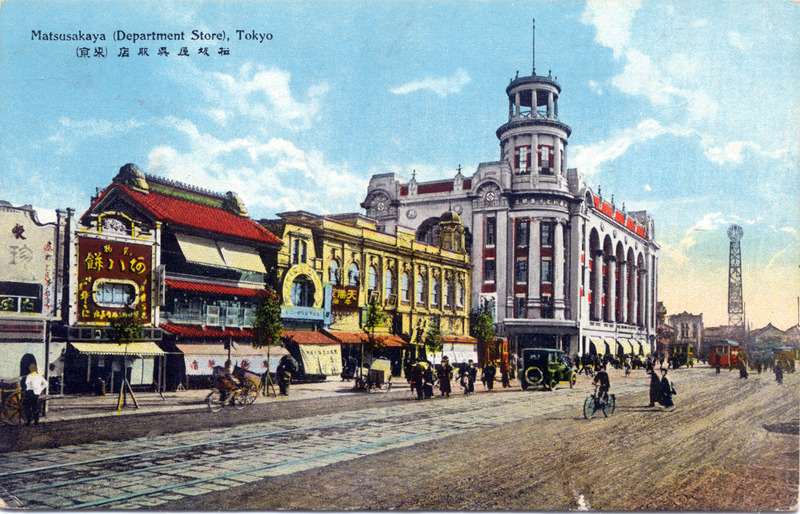 Matsuzakaya department store, Ueno, c. 1910. “Have you the Matsuzakaya habit? “This Wanamaker in the Orient is deservedly popular with most people in Japan, for it has acted up to its slogan, “High in Quality, Low in Price.” Matsuzakaya is one of the oldest stores in Japan, having behind it over 220 years’ experience. 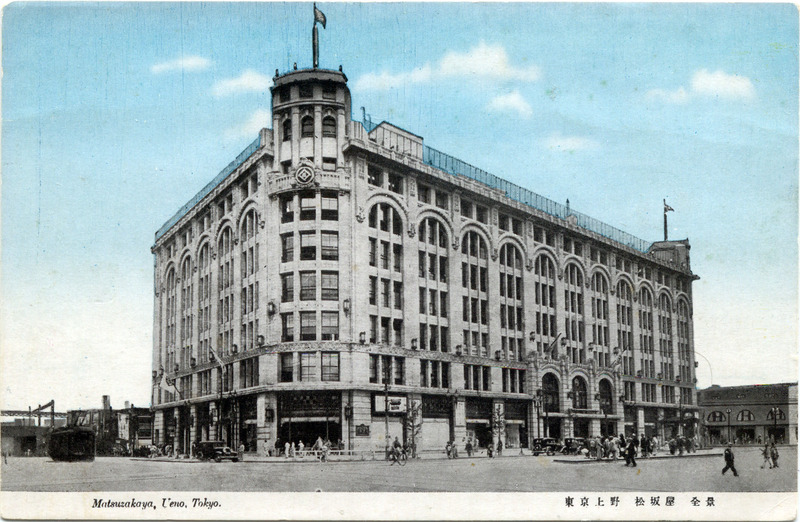 “Premises are a substantial re-inforced concrete building, having nine floors including the basement and covering a floor area of 10,000 tsubo. 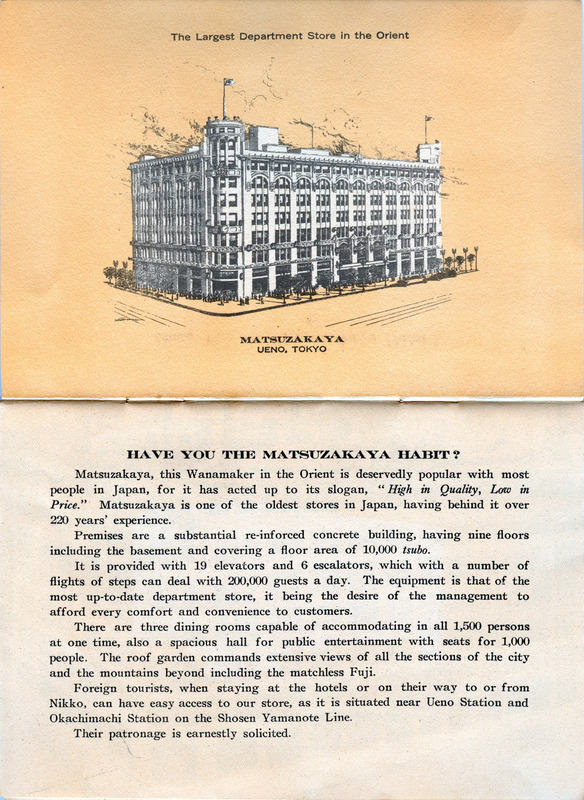 Matsuzakaya, Ueno, booklet, c. 1930. Ito Genzaemon Sukemichi in 1611 went into business as a kimono fabric and fancy goods wholesaler in Nagoya, making his concern one of Japan’s oldest surviving trading companies. Adopting a retail posture in 1736, Ito Gofukuten then became a kimono fabric purveyor to the Owari Tokugawa clan (descendent from the first Tokugawa shogun, Ieyasu) and, in 1768, after acquiring Matsuzakaya at Ueno Hirokoji in the feudal capital, Edo, continued business as Ito Matsuzakaya. Matsuzakaya department store (right) at Uyeno Hirokoji, c. 1920. 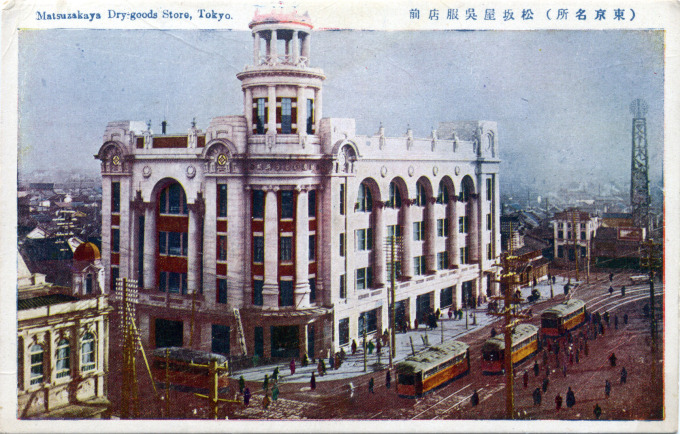 Matsuzakaya department store, on Ueno Hirokoji, c. 1920. 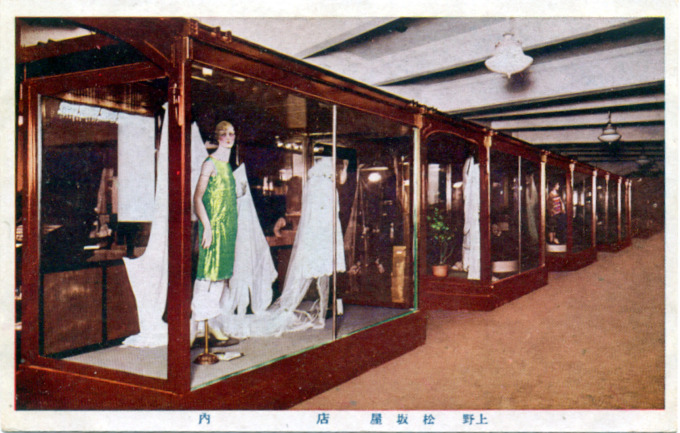 Matsuzakaya Ueno, display cases, c. 1920. Matsuzakaya Ueno, main floor, c. 1930. Matsuzakaya department store, Ueno, c. 1930. 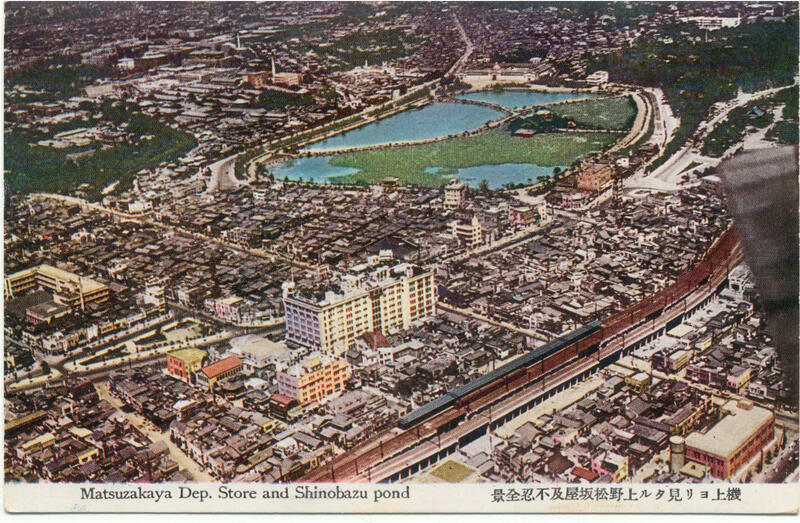 G. Aerial view of Matsuzakaya and Ueno Park, c. 1940. 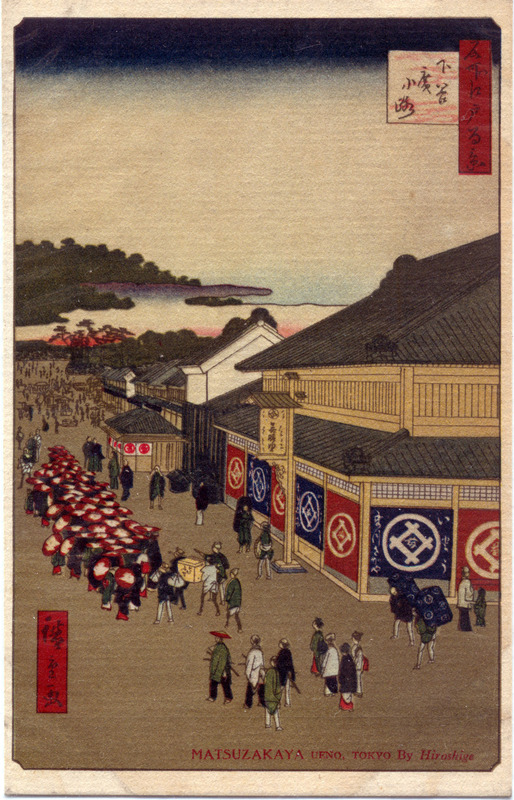 Matsuzakaya Gofukuten, Ueno, during the Edo Era. A c. 1930 shin-hanga reprint of a Hiroshige woodblock print. 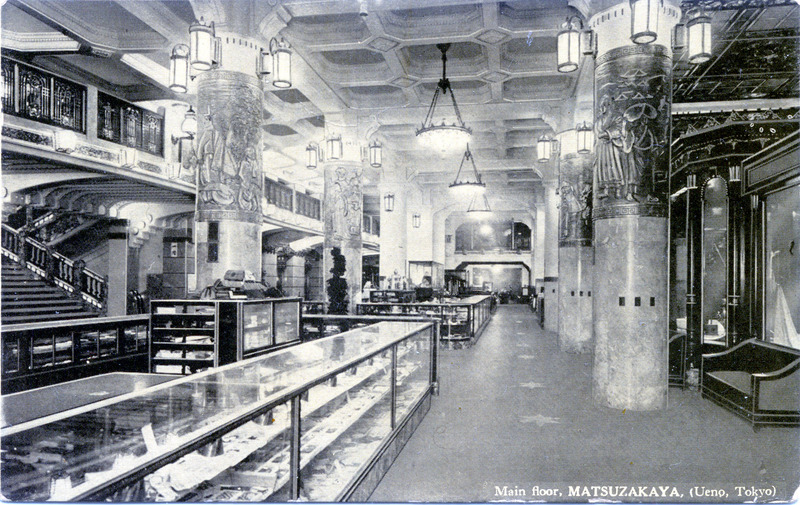 During the latter years of the Meiji era, now in competition with the nearby Mitsukoshi and Shirokiya department stores, Matsuzakaya built a Western-style, multi-story emporium in 1907 on the Ueno site. 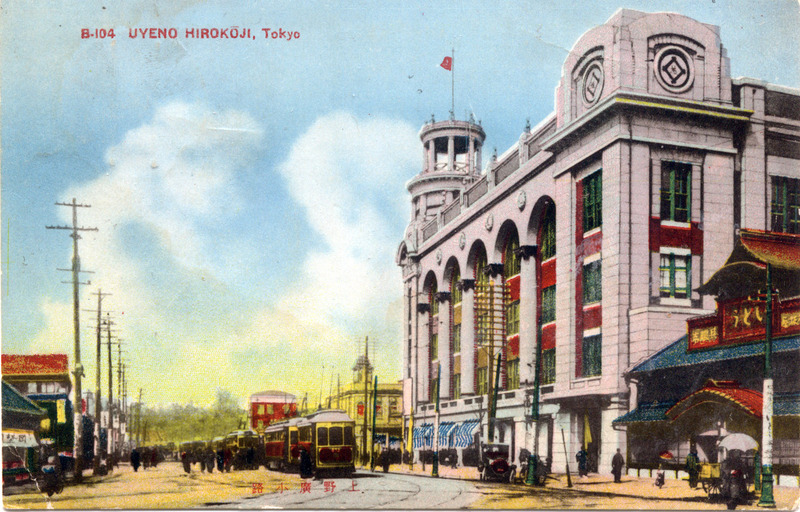 Destroyed by the 1923 Great Kanto earthquake, work was then completed in 1929 on a new 7-story flagship store. This new building boasted more than 78,000 square feet of display space, nineteen elevators, 6 escalators, air conditioning, restaurant seating for 1500 guests and a 1000-seat auditorium on the basement level, along with a roof-top children’s playground, small zoo, and an observatory and, as was customary of all department stores, a roof-top Inari [rice god] shrine. “A walking tour guidebook for lovers published in 1932 suggested that as one of its five ‘date courses’, a young couple could visit ‘The Five Great Department Stores by Subway’. After a rendezvous in the Ginza, the couple could start by shopping at Matsuya, before taking the subway to Nihonbashi for more shopping at Shirokiya and a memorial photograph at Takashimaya. They could then move on to Mitsukoshi where they could take advantage of the rest room and free tea service, before taking the subway once again to Ueno and having lunch together at Matsuzakaya.